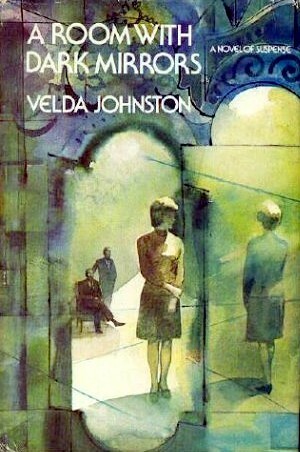 A Room with Dark Mirrors by Velda Johnston ~ 1975. This edition: Dodd, Mead & Co., 1975. Hardcover. 184 pages. I’m always on the lookout for light reading for my elderly, housebound mother; books are one of her last remaining pleasures after a very full and creative life now curtailed by painful and crippling severe osteoporosis and arthritis. Always a voracious reader, she prefers well-written, intelligent, but not necessarily “deep” books; she readily acknowledges many of her stand-bys to be leaning towards “fluff”, but she does prefer them to be high-quality and mentally engaging fluff. With this recent thrift-store pick-up, I may have tapped into a new “Mom’s author” to keep an eye out for in my rambles. Velda Johnston (1911-1997) was a prolific American writer of romantic-suspense and light-gothic novels. Doing a bit of internet research on her background, I find her listed as the author of 36 novels dating from 1968 to 1991. If this is correct, Velda Johnston’s published writing career spanned from her fifty-seventh to her eightieth year, leaving me a little curious about her full history and her earlier life. I was able to find only a few random comments on several of Johnston’s other titles, but the general tone is that they are well-written and surprisingly literary and intelligent for the genre. My experience with Dark Mirrors would bear this out. Dorothy Lang is a recently divorced stewardess who keeps running into her regretful and apologetic ex-husband Eric on her flights. He hopes to reunite, though Dorothy has a very legitimate reason to refuse his continual offers of reconciliation. This trip, they find themselves bound for the same area of Paris, where Eric has been posted on an engineering contract, and Dorothy has her stopover accommodation. Hurrying down a street, trying to avoid her ex-husband whom she rather suspects is following her, Dorothy is accosted by a strange man with a gun who orders her into a waiting car. Eric appears in the nick of time to act as white knight, and our story is well away. Does this sound rather trite and possibly a bit boring? Well, it is and it isn’t. Dorothy is a sweetly complex character for this type of thriller-lite; the very 1970s plot requires a certain suspension of disbelief; but I found myself a willing partner in Dorothy’s adventures. The ending left me wryly smiling, with a bit of a “I can’t believe I ate the whole thing” feeling, but, on the whole, I’d cheerfully read another of Velda Johnston’s books if it appeared in my reading stack and I was too tired to engage in something more intellectually challenging. Perfect fare for summer reading for my mom, and anyone else looking for a mild trip down a recent(ish) memory lane; the 1970s setting and the evocation of the “glamorous” life of a an airline stewardess will stir nostalgia to any of us who remember that decade well, and possibly provide a bit of a chuckle for a younger generation. Our heroine Dorothy has enough deprecatory self-awareness and natural wit to be an enjoyable companion for the few hours it takes to get her sorted out and back on track after her Parisian adventure.